How would you have countered Mourinho’s tactics yesterday? Having watched the Liverpool v Chelsea match this weekend, I got to thinking about how an attacking, attractive footballing team can overcome a team who ‘park the bus’ as Chelsea did on Sunday. So I’d like to explore the subject, using Liverpool v Chelsea as an example, and I’d love coaches to get involved in this conversation by adding your ideas and thoughts via the comments? Liverpool have blown teams many away this season, especially at Anfield, by attacking at pace with very mobile, quick-thinking forward players. That starts with Gerrard in the holding midfield role, who is able to play long, accurate balls to players like Sterling, Coutinho, Sturridge and of course the newly crowned PFA Player of the Year, Luis Suarez. Liverpool usually create space by exhibiting great movement and by attacking at pace. By getting the ball forward quickly and to feet, with movement off the ball, it often pulls defenders out of shape and creates spaces for the forwards to exploit in between defending players. They also have a forward line who can beat a man, which of course helps. I can recall two occasions however this season where opposition teams at Anfield have ‘parked the bus’ in as much as they packed the defensive third of the pitch in order to limit the space in which Liverpool want to attack. Against Chelsea, that defensive mentality was ironically best illustrated by Chelsea’s first goal. When Steven Gerrard’s slipped, he was just in his own half and Demba Ba was the only Chelsea player anywhere near him. A few weeks previously, Sunderland tried a similar tactic, but they defended with a slightly higher line and it took a free kick from distance to break the deadlock and for Sunderland to then come out and play. So it got me thinking. What can you actually do about it as a coach, when faced with a team that have 10 men behind the ball? For long periods yesterday Liverpool were camped in the Chelsea half, passing the ball in front of ten Chelsea players, and finding no space to play in the final third. In the end, Gerrard, Allen and others resorted to shots from just outside the box, without any joy. Although it didn’t work for Liverpool yesterday, I am thinking that shots from the edge of the box might be one of the tactics to employ when there are eight or nine players defending the penalty area. Trying to work the space to get as near as you can, and then aim to hit an in-off shot, sounds more like billiards than football, but it is difficult to know what else to do in such a crowded penalty area? To try and wriggle through that many players with dribbling and quick passing is extremely difficult. Maybe practicing hitting shots from the edge of the area, at pace, that are around knee high to the defenders would offer the maximum chance of a defender deflecting the ball past a partially unsighted goalkeeper? Or maybe even slightly higher than the knee to tempt the defenders into using their hands? Yesterday, Mourinho set out to frustrate from the off by setting up with ten men behind the ball, and time wasting in order to take the pace out of the game. He closed off the space in the final third to stifle Liverpool’s attacking flair, and fortuitously nicked a goal at the expense of the slipping Steven Gerrard. His tactics ultimately worked, but it would have been interesting to see how Chelsea would have developed from there had Gerrard not slipped, because they never looked like scoring without that bit of luck. So how would you have changed things if you were the Liverpool manager against Chelsea yesterday? 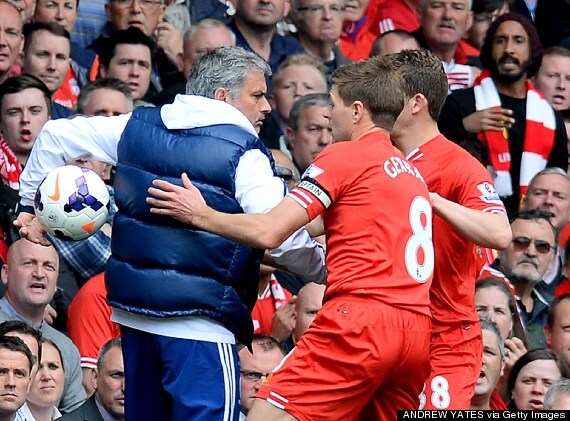 Format ChatPosted on April 28, 2014 April 28, 2014 Tags 27.04.2014, Anfield, Liverpool v Chelsea, Mourinho tactics, park the busLeave a comment on How would you have countered Mourinho’s tactics yesterday?